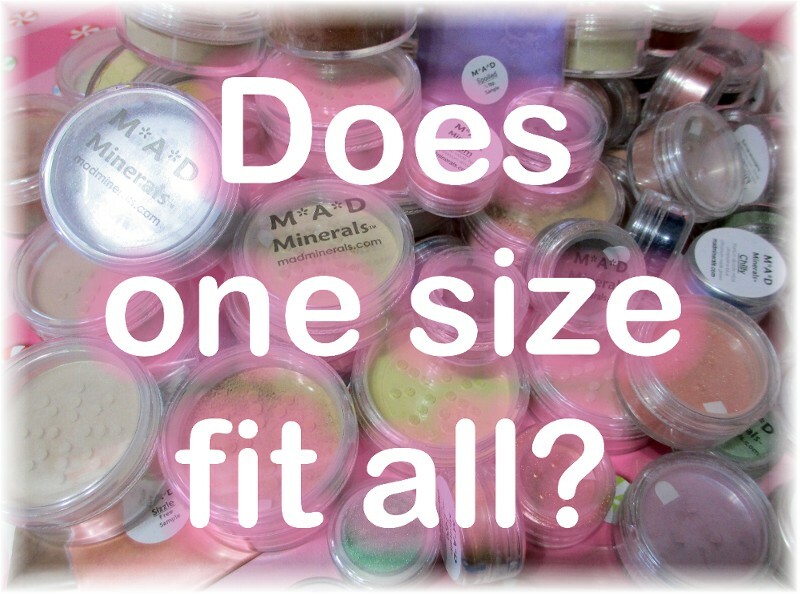 I hear this all the time…why do you offer your mineral makeup in eleven different sizes? For starters, in my personal opinion, i don’t believe one size does fit all. Am i crazy? Hence the name mad minerals! Maybe, maybe not! ¼ TSP SAMPLE BAGGY – inexpensive way to try out our minerals – light weight for our international customers. Unlimited amount of baggy samples that ships for only $3 worldwide. ¼ TSP SAMPLE JAR – inexpensive way to try our minerals, but prefer the samples in a jar instead of the baggy. 3G SIFTER JAR – for those that want more than just a sample size (each one approx. Equal to 3 samples in one jar. 30G SIFTER JAR REFILL BAGGY – again, for those that want to save some money & re-use the jar. Lighter weight for shipping. 30G SIFTER JAR – our largest sized jar. It has the same diameter of the 20g jar, but is taller. Functions the same as our 20g jar, but holds more product. Holds approx. 5-6 teaspoons of mineral powder. Q: Can you tell me how many grams of mineral powder is in each jar? We package our minerals by volume, not by weight because the minerals have various weights depending on the color, texture, etc. For example, A full 30g sifter jar of Fair foundation may only weigh 10 grams, while a full Natural Dark foundation may weigh 13 grams. Darker minerals generally weigh more then lighter minerals. Silk Veil finishing powder is very light in weight, therefore a full 30g jar may only hold 5 grams of it. We just make sure that every jar is full! Here are the approximate weights per jar. Of course, depending on the type of mineral powders. 5g sifter jar holds .75-1.5 gram powder - Approx. 3/4 tsp. - 1 tsp. 5g Jar without sifter holds 1-2.5 grams powder - Approx. 1 tsp. - 1 1/2 tsp. 10g sifter jar holds 2.5-4 grams powder - Approx. 2 tsp. - 2 1/2 tsp. 20g sifter jar holds 4.5-8 grams powder - Approx. 1 - 1 1/8 Tbsp. Each full size jar is packed full to our ability. However, during shipping there may be some settling, some jars may appear fuller than others. Q: I received my 30g Refill Baggy, Why is it only 10 grams of powder? Please let me clarify the refill baggies. It can be confusing to many. These refills will refill the size of the jars stated. For example: (30g Refill Baggy) - A 30g sifter jar holds approximately 9-13 grams of mineral powder depending on the type or shade of minerals you are purchasing. Silk Veil finishing powder is one of our lightest in weight & may even weigh less than 9 grams. You will NOT receive 30 grams of mineral powder. You will receive plenty enough to refill the empty jar size that you purchased.